More than 90 years ago, in 1922, in Egypt’s Valley of the Kings, archaeologist and Egyptologist Howard Carter made the greatest archaeological find in history: the discovery of Tutankhamun’s tomb and its golden treasures worth nearly a billion dollars. Carter’s find made Tutankhamun the most famous pharaoh in ancient Egyptian history. But the real story of King Tut has become shrouded in myth, with many mysteries around his tomb unsolved to this day. In Ultimate Tut, a special two-part Secrets of the Dead, Egyptologist Chris Naunton mounts the most comprehensive investigation ever undertaken to build the ultimate picture of Tutankhamun. 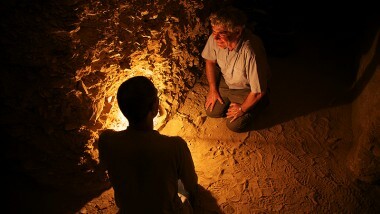 Naunton takes a 21st century approach to ancient history, bringing together the latest evidence from a team of archaeologists, anatomists, and geologists; and blending 3D graphics, stylized reconstruction and action-adventure forensic investigation, to offer fresh insights into how Tutankhamun was buried, why his tomb was the only one to remain intact, and the enduring enigma around how he died. ©2013 Blink Films and Handel Productions (TUT) Inc.